Flip This (Mini) House is on Instagram! 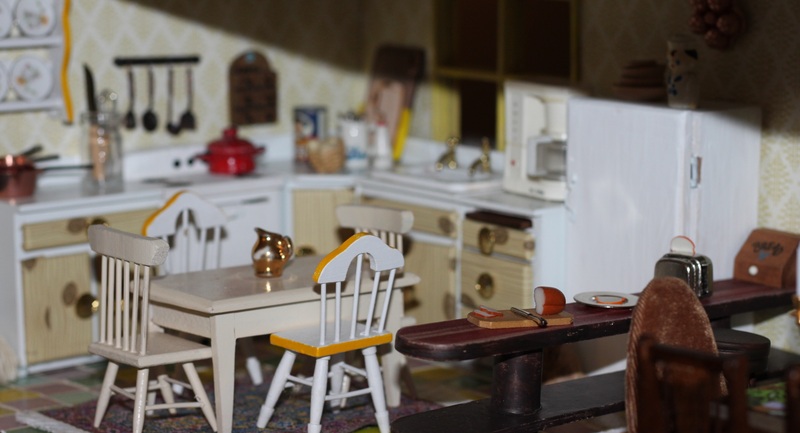 You can follow Flip This (Mini) House on Instagram too! Stop on over and say Hello! Since my dollhouse is done, I’ve been having some fun decorating a room box. 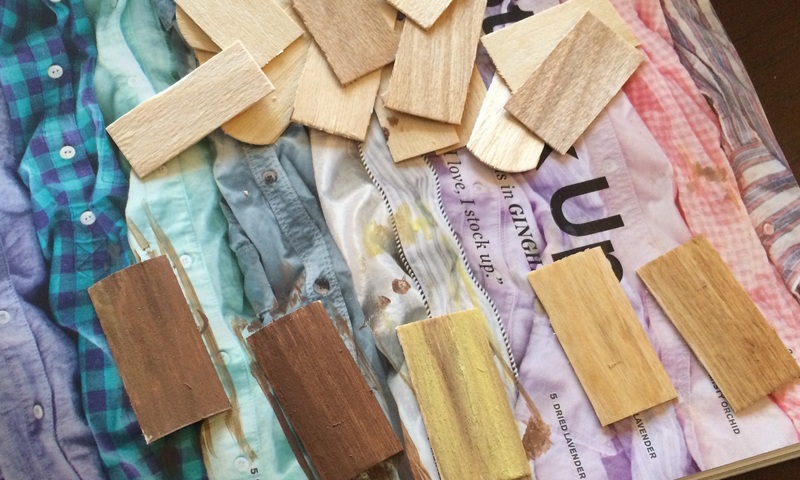 This is the perfect project for a beginner, someone on a budget, or anyone with a short attention span! Any cardboard shipping box is all you need for your structure. Dress it up with scrapbook paper, mini furniture and accessories. 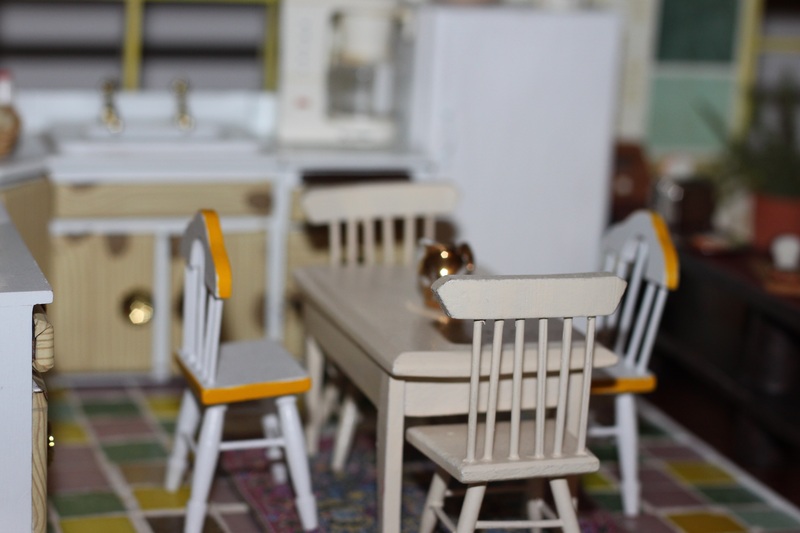 Below are a couple of recent projects, including a bohemian bedroom, inspired by a clearance iron-on butterfly I bought a couple days ago, and a Christmasy room filled with clearance minis. 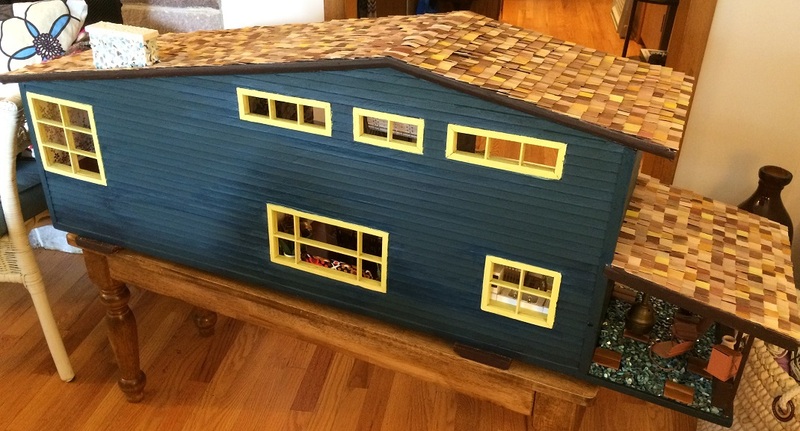 Much of the art, furniture, and accessories in the Flip This (Mini) House project are repurposed objects I found for next to nothing at garage sales and thrift stores, or that I created from materials from craft stores and hardware stores. A closer look at the Flip This (Mini) House living room. To learn how to make a bubble chair, faux modern pendant light, and much more, take a look at old posts. For the past few months, I’ve been holding off on revealing the Flip This (Mini) House project. 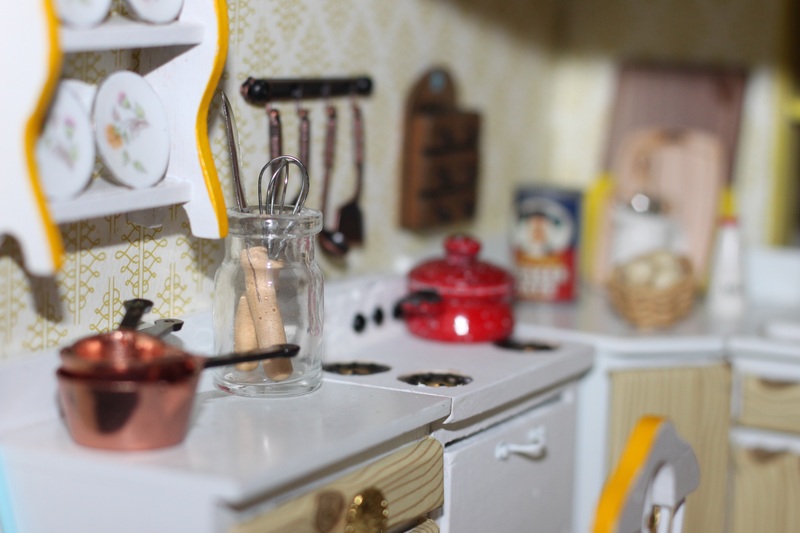 Today’s the day I’m going to give you a closer look at some of the finished details, starting with the kitchen! Let me know what you think! Mini kitchen reveal. Photo by Holly Tierney-Bedord. All rights reserved. 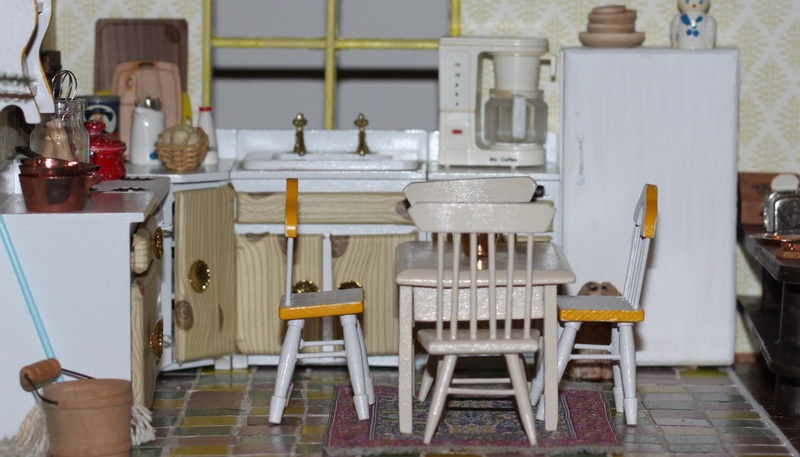 Tiny kitchen, flipped. Photo by Holly Tierney-Bedord. Flip This (Mini) House. All rights reserved. 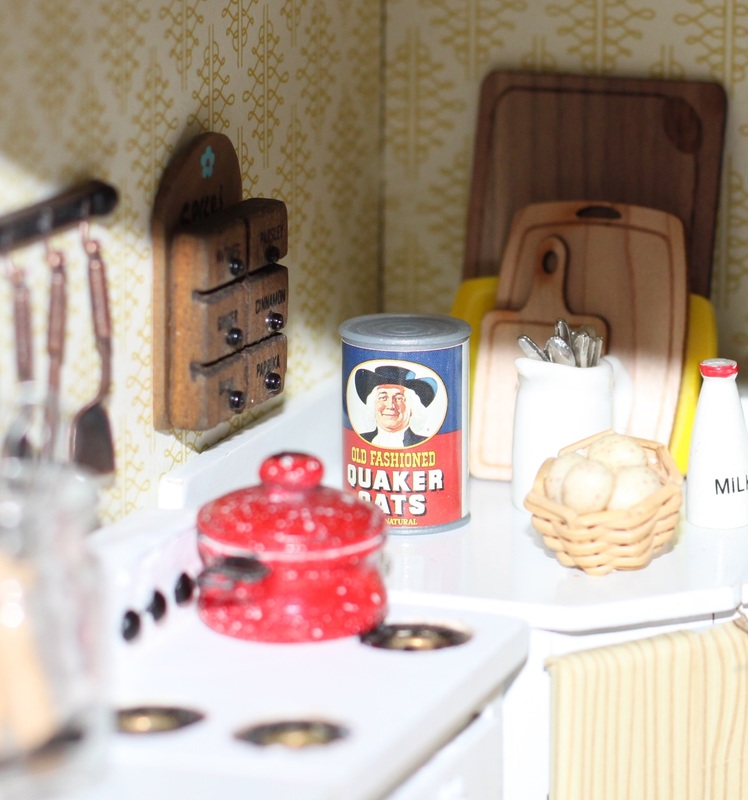 Something’s cooking in the kitchen… Photo by Holly Tierney-Bedord. Flip This (Mini) House. All rights reserved. Flip This (Mini) House — almost completed! Photo by Holly Tierney-Bedord. All rights reserved. Soon you’ll get to see the other side! See which of my handmade items, eBay finds, splurges, and repurposed household objects made the final cut. But first, there are a few more pieces of trim to install, a couple of places where the paint needs to be touched up, and a some final decorating decisions to be made. Here’s a look at my nearly finished roof! As you can also see, the chimney will be covered in blue stones to match the exterior paint. Once I add grout it will look better. This part of the project has taken as long as the rest of it combined! Miniature Schnauzer & Miniature Roof Makeover. Photos by Holly Tierney-Bedord. All rights reserved. 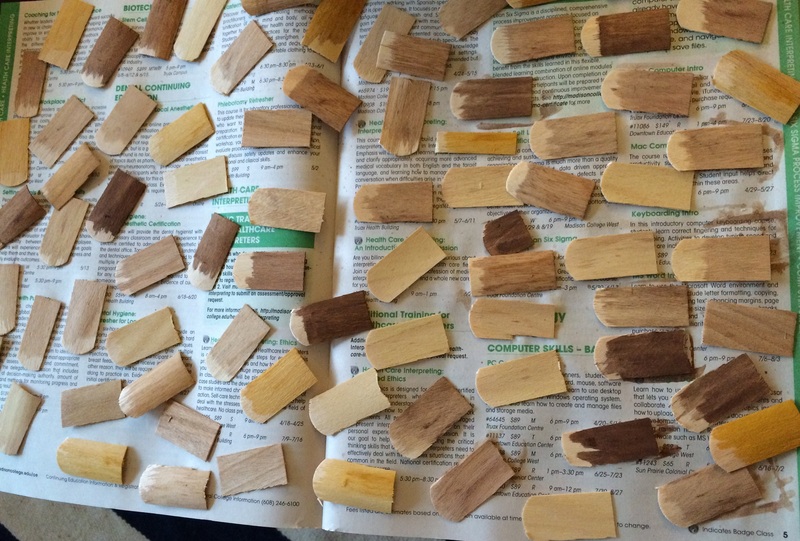 Painting dollhouse shingles. Photos by Holly Tierney-Bedord. All rights reserved. 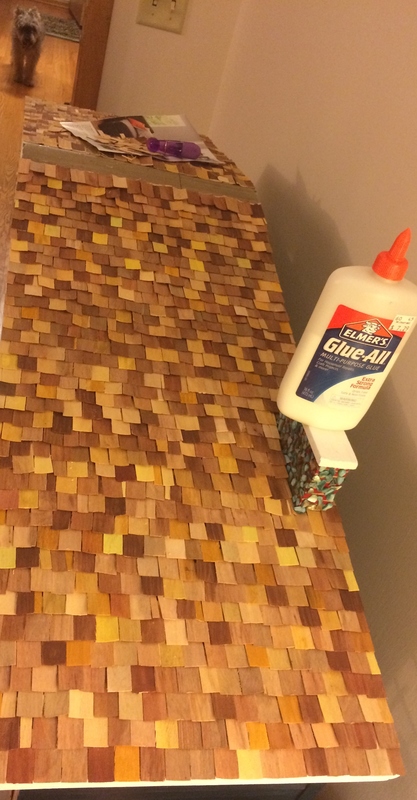 I’m trying out paint colors on shingles. I’ve decided to go with a mix of yellows and browns. You may be tempted to shingle your house and paint it later, since this is much faster than painting shingles individually. I think it’s worth the extra time to paint them individually, varying the color a bit from shingle to shingle, so your finished product looks more realistic. I will show you where to start applying your shingles soon! More shingles. The fishscale style are fine for my house — I’ll just keep the round part hidden beneath other layers. It takes a long time, but this is what television is for. So you can watch it, guilt-free, while accomplishing mindless projects like painting 8 zillion mini shingles. Have I mentioned how excited I am that the Real Housewives of New York are back? I love them all!!!!! Even Ramona has carved a small place in my heart. My mini cutting board collection is complete! 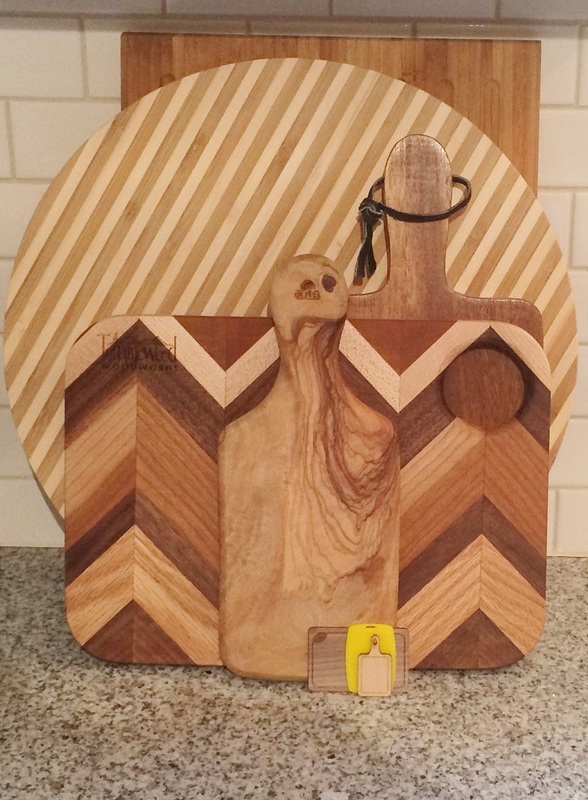 In my real (human scale) home, I have a collection of cutting boards, so naturally my mini house needed one as well. 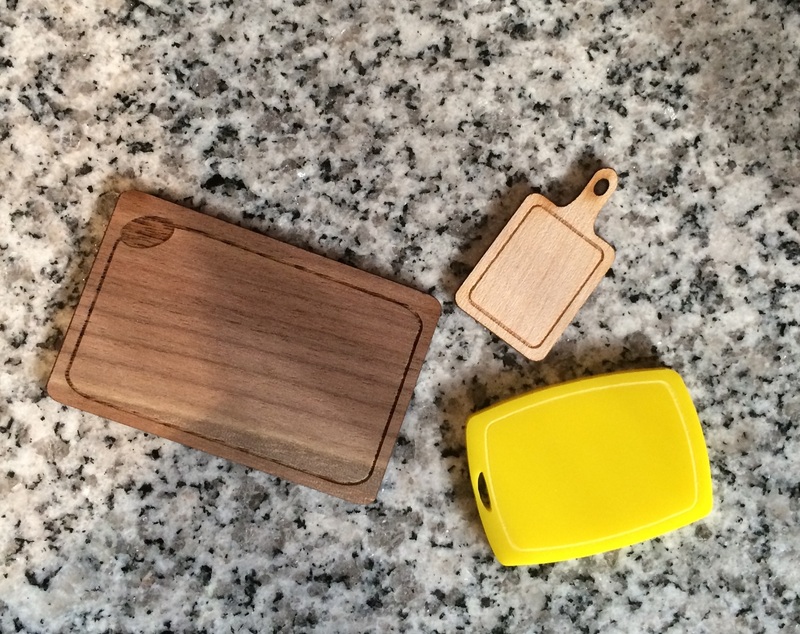 At the miniature show in Chicago, I found three new mini cutting boards, all from seller Dragonfly International. 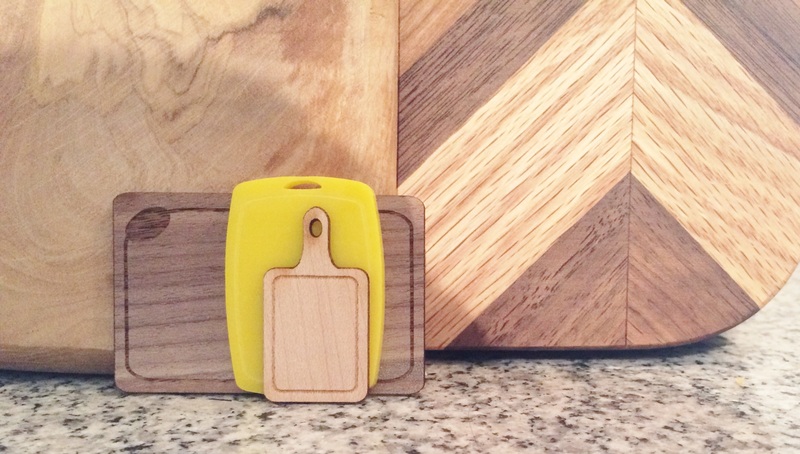 I already have a couple other mini cutting boards, so now my collection is complete. 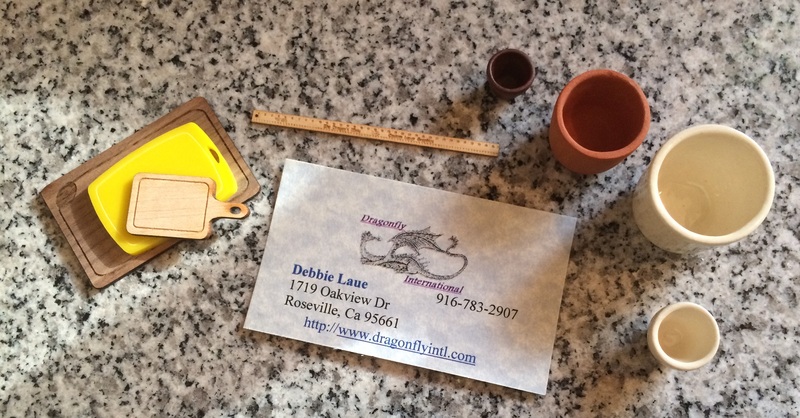 Also, check out the adorable pots and yardstick, also from Dragonfly International! 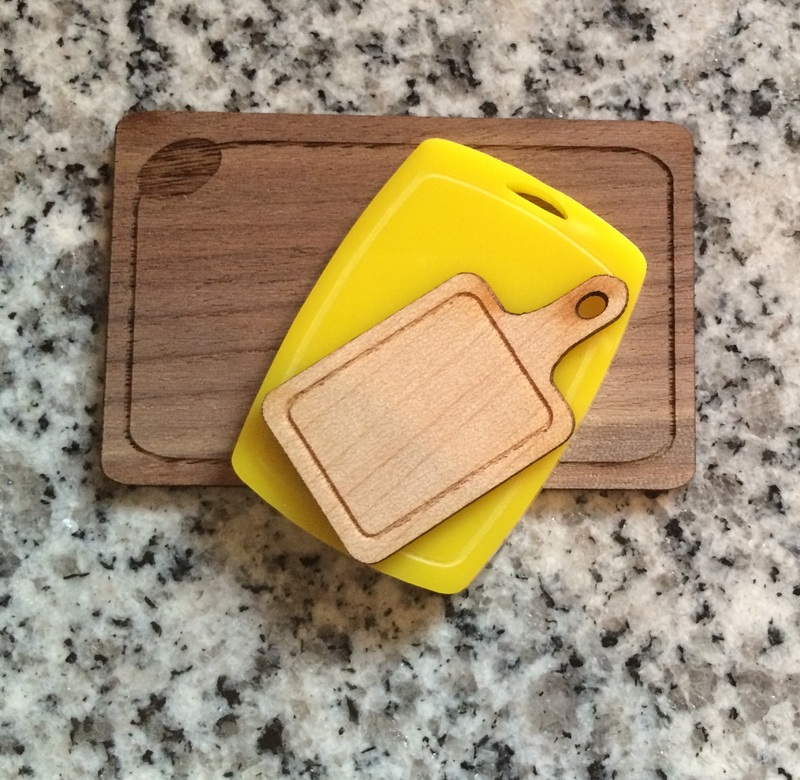 Regular cutting boards and mini cutting boards. Photos by Holly Tierney-Bedord. All rights reserved.